Tuesday, 4th of April 2017, the selection of the Bonairean waterpolo team left for the Bahama’s to compete in the International Championships Carifta 2017. Carifta is an aquatic championship in the Caribbean where athletes are divided in age groups. These championships are organised annually under the auspices of the CANOC, the “Caribbean Association of National Olympic Committees”, taking place this year on the Bahama’s. The competing countries were: Bahama’s, Barbados, Bonaire, Jamaica en Trinidad. 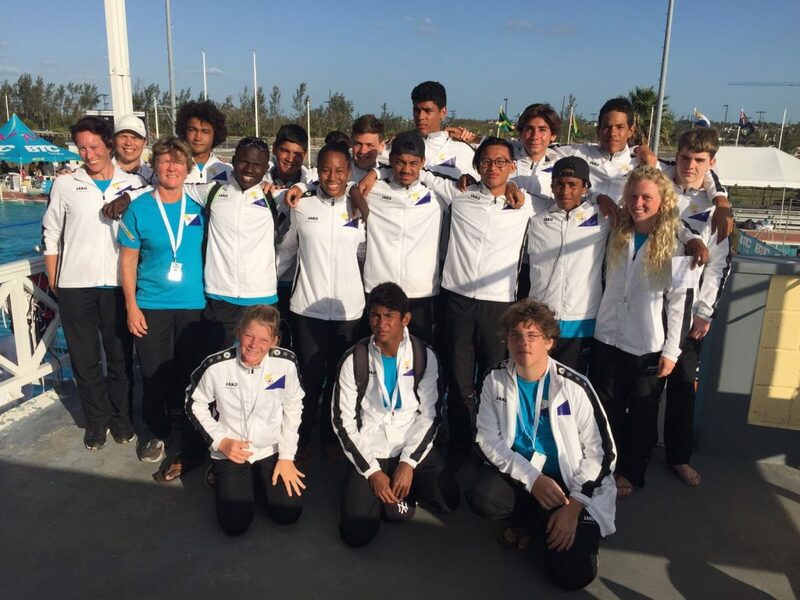 Bonaire has competed in the age groups under 16 and under 19. In total 17 boys and girls traveled to the Bahama’s together with their coaches to compete internationally. We are very proud of our participation in the Carifta Waterpolo Championships. Waterpolo is a very young sport on Bonaire and we only started playing 5 years ago. A few of our players selected have been playing for only a year or so. The Bonairean teams were the only coed team, meaning the teams consisted of both boys and girls. Our ladies have held up well against their males opponents in both the U16 as well as the U19 category. Also Bonaire does not have many players to choose from and some of our players played in both the U16 and the U19 team. For those this double tournament was a very hefty weekend. Therefor Bonaire did not make it to the top 3, however we did show that we are a formidable openent with a lot of competence. For example Knut Pedersen received a price for the best defender of the tournament. Chaz Sweers was praised by a Fina Official (International Swimming Federation) as an example for the waterpolo sport. The game of the U19 team against Barbados for the bronze medal was pretty exciting ending in a score of Bonaire 8 – Barbados 11. Both teams, U16 and U19, grew immensely during the tournament. The players themselves said that they learned more in this one tournament than in a whole year of training. For Bonaire participation this year is a part of the preparation for the Carifta Waterpolo Championships of 2018. We hope to be able to play for the prices with teams that have grown in the coming year. We would like to thank our sponsor for the opportunity given to our youth; Openbaar Lichaam Bonaire, Tourism Corporation Bonaire, Fundashon Wega di Number, the parents and of course the players that worked hard with organising sponsorevents.